Now I feel it's so hard to eat fresh fresh cucumber like in the past when I was living in the villiages where I could easily get fresh cucumbers in the farmland. We could only bought them in the supermarket or in the food market. You can imagine they are one days early picked at least since they have to be get packaged and transported, then finally get into your bowls. The best way to eat vegetables is to grow them in the garden yourself. 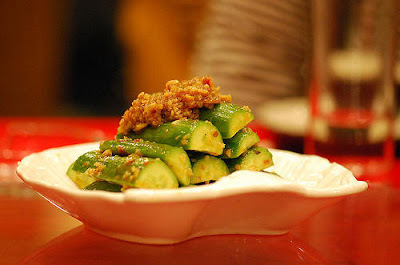 Cucumber is such a great vegetable that contain many Vatamin C and other benefitial elements.